Howard Daniels, who lived from 1815-1863, was a noted architect and landscape gardener. 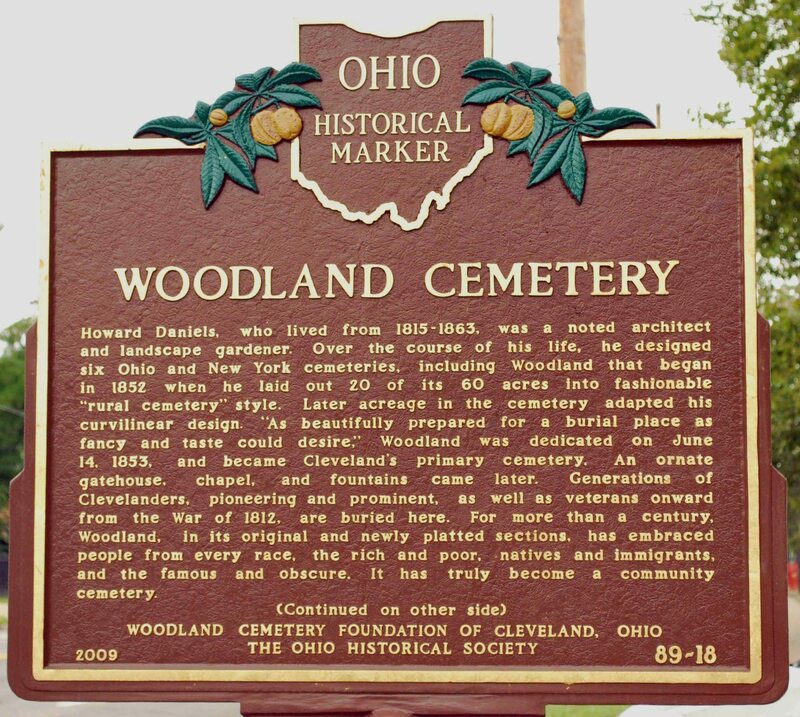 Over the course of his life, he designed six Ohio and New York cemeteries, including Woodland that began in 1852 when he laid out 20 of its 60 acres into fashionable “rural cemetery” style. Later acreage in the cemetery adapted his curvilinear design. 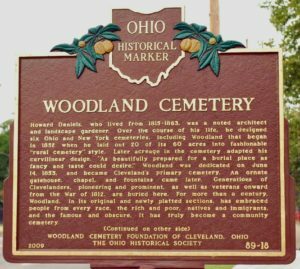 “As beautifully prepared for a burial place as fancy and taste could desire,” Woodland was dedicated on June 14, 1853, and became Cleveland’s primary cemetery. An ornate gatehouse, chapel, and fountains came later. Generations of Clevelanders, pioneering and prominent, as well as veterans onward from the War of 1812, are buried here. For more than a century, Woodland, in its original and newly platted sections, has embraced people from every race, the rich and poor, natives and immigrants, and the famous and obscure. It has truly become a community cemetery. Woodland Cemetery’s first burial, which occurred on June 23, 1853, was 15-month old Fanny Langshaw. Two Ohio governors, Reuben Wood (1850-1853) and John Brough (1864-1865), are here as are several nineteenth-century Cleveland mayors. Other notables include John P. Green and William H. Clifford, African American legislators; Joseph Briggs, developer of free city mail delivery and national postal superintendent; Levi Johnson, ship and house builder; J. Milton Dyer, Cleveland City Hall’s architect; and Eliza Bryant, founder of the Cleveland Home of Aged Colored People. Groups that have plots for their members here are the Old Stone, Trinity and Woodland Avenue Presbyterian congregations; Grand United Order of Odd Fellows, and Cleveland Firemen’s Relief Association. Woodland Cemetery was listed on the National Register of Historic Places in 1986 and was designated a Cleveland Landmark in 2008. Howard Daniels (1815-63), noted for cemeteries in Cincinnati (Spring Grove, 1846), Xenia (Woodland, 1848), and Columbus (Green Lawn, 1849), was the architect for what is now called the Old Montgomery County Court House (1845) on Dayton’s Courthouse Square. A prolific proponent of landscaping, Daniels called the rural cemetery a “peculiarly American institution” whose presence in large cities paved the way for “the next great step in rural progress… providing public Gardens and Parks for the people.” He died while working in Baltimore; he is buried in Green Lawn Cemetery. Joseph Ireland (1843-1905), a New York born and trained architect, practiced in Cleveland from 1865-85. Twenty-seven of his more important works are listed on the Cleveland Landmarks Commission’s website. Unmentioned are his numerous public projects, such as Euclid Twp. Cemetery’s vault and Woodland Cemetery’s elaborate gatehouse (1870), dismantled in 1996 but awaiting reconstruction. In the 19th century churches, lodges, professions, and benevolent organizations often formed cemeteries specifically for their member or purchased lots in existing cemeteries to provide a secure place, not the potter’s field, for their dead. The marker identifies five such organizations with lots in Woodland Cemetery.